Some Borders scientists reckon some new DNA results shed light on the Royal Family Tree. BritainsDNA is a company based in Melrose - they claim to have discovered a direct genetic link between Prince William and a part-Indian ancestor. Working with the University of Edinburgh to analyse saliva samples from the Duke's relatives, they claim to have discovered a link between the future king and a woman who was the housekeeper of one of his ancestors, in the 18th century, who worked for the East India Company. What we're trying to do is look at Britain and the whole national genome, but everybody is interested in royal DNA. Royal lineages have been of public interest for centuries. We simply came across this and followed it up. It's a very positive story. Mr Moffat also researched some of the historical background and found that Theodore Forbes was the third son of a landowning family and had gone to India to seek his fortune. It was pretty clear to him that he wasn't going to inherit the property, so he came down to Leith (near Edinburgh) and I believe he got involved in the tea business. He made contact with the East India Company and got himself a job. He went out (to India) as a young Scotsman on the make and it appears he was successful. That's where he met Eliza and he employed her as his housekeeper. It wasn't uncommon for young British men to have relationships with Indian women. Mr Moffat said it was "fantastically exciting and unexpected" to uncover such as story in the future king's family tree. Alistair Moffat, managing director of BritainsDNA, which is based in Melrose in the Scottish Borders explained the thinking behind the research. What we're trying to do is look at Britain and the whole national genome, but everybody is interested in royal DNA.Royal lineages have been of public interest for centuries. We simply came across this and followed it up. It's a very positive story." The Duke of Cambridge has proven Indian ancestry, according to new DNA analysis by scientists from Melrose based BritainsDNA and the University of Edinburgh.Saliva samples from Prince William's relatives discovered a direct link between the future king and a woman who was part-Indian. The connection traces back eight generations, with the woman, Eliza Kewark, being the Duke's great, great, great, great, great grandmother.She was housekeeper to his fifth great-grandfather Theodore Forbes, born in 1788, a Scottish merchant who worked for the East India Company in Surat. Researchers used a mixture of traditional genealogy and cutting-edge science to come up with the findings. It shows that the second in line to the throne carries Eliza's mitochondrial DNA (mtDNA). Mitochondrial DNA is a small piece of DNA inherited mostly unchanged from a mother to her children. Prince William and his brother inherited Indian genetic markers from their maternal line from their mother Princess Diana. The connection traces back just eight generations, with the woman, Eliza Kewark, who was housekeeper to his fifth great-grandfather Theodore Forbes, born in 1788, a Scottish merchant who worked for the East India Company in Surat, a port north of Bombay. The DNA was passed down through Eliza's daughters and granddaughters to Princess Diana. Prince William, Princess Diana and Prince Harry pictured at Niagara Falls in 1991. Credit: Martin Keene/PA. Eliza, who was born around 1790 and lived in India when it was governed by the East India Company, is thought to have had Armenian blood because of her surname and the presence of Armenian script in letters from her to Theodore. Dr Jim Wilson, a genetics expert at the University of Edinburgh and chief scientist at BritainsDNA, who carried out the scientific research said very little is known about her, including when she died. He said: "Theodore described her as his housekeeper. It appears they weren't married. "Mixed blood is something we celebrate today but that was very much not the case in the past." This is a great example of how genetics can be used to answer specific historical questions and uncover fascinating facts about our ancestry. This was independent evidence that there was Indian ancestry. For me, it corroborated the findings from the mtDNA. We've got two different kinds of genetic evidence that are independent from one another and they both corroborate the story. So it really seems that our future king has a little bit of Indian blood. 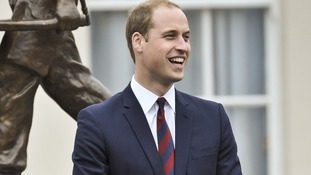 The Duke of Cambridge has proven Indian ancestry, according to new DNA analysis. Scientists testing saliva samples from Prince William's relatives discovered a direct link between the future king and a woman who was part-Indian. The research shows that the second in line to the throne carries a rare form of mitochondrial DNA (mtDNA) from his great-great-great-great-great grandmother. Mitochondrial DNA is a small piece of DNA inherited mostly unchanged from a mother to her children. The mtDNA was passed on through daughters and granddaughters directly in an unbroken line to Princess Diana, then on to Prince William and Prince Harry. Scientists said it is "very likely" that Prince William's heirs will also carry a small proportion of Indian DNA from Eliza, whose father may have been of Armenian descent. New research has found that Prince William has Indian ancestry stretching back generations inherited from his mother Princess Diana.